There’s more to this. Israeli adulation for the Dutch ultra-nationalist is not limited to the National Union: Manfred Gerstenfeld, Chairman of the Board of Fellows at Dore Gold’s neoconservative power-house — The Jerusalem Center for Public Affairs — has been a leading cheerleader. Cooperation between the extreme right wing in Holland and Israel: Dutch anti-Muslim nationalist Geert Wilders will come to Israel in order to support the idea that “Jordan is the Palestinian nation state,” which is being promoted by MK Arieh Eldad (National Union). Eldad, chairman of the Hatikva party, one of the constituent parties of the National Union, is convening a special conference of his party in order to discuss an “alternative foreign policy plan,” which mainly consists of recognition of the fact that Jordan is the Palestinian state, while only one state will exist between the Jordan River and the Mediterranean Sea—the State of Israel. MK Eldad will present the main points of his idea at the conference, which will be held in Tel Aviv at the beginning of next month. Eldad will be followed by a guest speech by the Dutch nationalist Wilders, in which he will voice support for the idea of establishing a Palestinian state in Jordan. Former defense minister Moshe Arens and former GSS director Ami Ayalon were invited to the conference in order to respond to the speeches. The party led by Wilders, the Dutch Party for Freedom, currently holds 24 of the 150 seats in the lower house of the Dutch Parliament. Wilders, who is opposed to Muslim immigration to Europe, sparked a furor following the film “Fitna” that he wrote, produced and directed in 2008. In the film, he presents Islam and the Koran as a religion that supports terror. Since then, he has received many death threats and is under heavy security. But now the cat is out of the bag. Im Tirtzu is no longer calling for changes in curriculum content; it is waging an ugly political battle over staffing: It wants the lecturers replaced. The movement’s campaign has thus undergone an enormous shift. At first, it complained of (leftist) political considerations in the appointment of lecturers and said this must not be permitted. Now, it says (rightist) political considerations should govern the appointment of lecturers. Moreover, Im Tirtzu prides itself on its Zionist orientation. This writer is also a Zionist, and proud of it. But Zionism, like any national movement, has different shades and expressions. And Im Tirtzu’s shade appears to be blatantly anti-patriotic. Instead of being proud of the scholarly achievements of Israeli researchers, the movement is threatening to stop donations by Jews abroad. Maybe this is a Zionist act, according to their understanding of Zionism, but it is certainly not a patriotic one. In practice, Im Tirtzu is joining those who call for a boycott of Israeli universities. The members of this organization clearly love the State of Israel. They speak of Zionism with sparkling eyes and are prepared to fight for it. But the main difference between them and the folks of the university is precisely the main difference between Ben-Gurion and others who speak daily about the importance of settling the Negev: they spoke, he acted. So one moment before somebody rushes on a journey to stop the donations from America, he or she will be better off undertaking a Zionist act and going for a journey across the Negev. The journey will end with a tour of the university. Anyone seeing and getting to know this glorious and important institution will realize that no lecturer, as anti-Zionist as he or she may be, can bring it down. The most important and powerful Zionist movement in Israel today includes more than twenty thousand students, and it both researches and creates social involvement. It’s name is Ben-Gurion University. “Im Tirtzu misrepresented its focus when they told us their mission was strictly Zionist education,” Ari Morgenstern, the spokesman for JHM [John Hagee Ministries], said. Following the storm, the central funder of the Im Tirzu movement has stopped the flow of funds [link in original to Hebrew version]. Let’s ignore, for now, the repeated lie that Im Tirzu demanded the dismissal of lecturers at Ben Gurion University, and that they were critical of “left-wing bias” when their letter talked about “right-wing bias”. Natasha Mozgoviya [Haaretz’s DC correspondent] that Preacher John Hagee, the same one who was called “marginal”, “extremist”, “apocalyptic” and many other compliments, will stop his contributions to Im Tirzu. (In my opinion, that’s a good thing and it’s about time.) 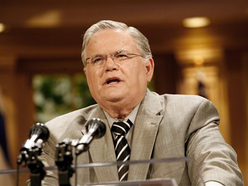 But this seems proof that Im Tirzu’s agenda, in contrast to what left says in its criticism, is incompatible with the agenda of the infamous Hagee. Only in Israel, as they say. Settling the Negev has always been one of the guiding principles of the Zionist movement. The man to have exalted this principle more than all others was David Ben-Gurion, the most wise and Zionist leader the state could have sought. Ben-Gurion viewed the settlement of the Negev as a primary social, economic, and national undertaking. Contrary to those who speak eloquently about values and Zionism but in practice do nothing, Ben-Gurion acted according on his belief and joined Kibbutz Sde Boker. Recently an organization called Im Tirtzu has begun a tough campaign directed against the university named after Ben-Gurion. This organization has even informed the university’s president Prof. Rivka Carmi that in the event that she fails to dismiss faculty members with “left wing agendas” it will approach foreign investors and ensure that they cut off their donations to the university. This organization has been conducting its campaign in the name of Zionism. In the name of Zionism it is threatening to harm one of Zionism’s most beautiful, important and successful enterprises in Israel. Ben-Gurion University and the adjacent Soroka Hospital are among Israel’s most successful and great institutions. The university is the main reason that youth leave central Israel and move to the Negev. The university conducts extensive and invaluable social activity among Israel’s southern communities. Beer Sheva’s university students are the most socially active, the most familiar with their communities and involved in them. I am not familiar with these youths of the Im Tirtzu movement. It may be fairly presumed that they are indeed conducting their activity with the profound belief in the justice of their ways and love for the State of Israel. I believe, truly and honestly, that Israeli lecturers who publish articles that call for an academic boycott on Israel are unworthy of academic posts that are financed by the Israeli taxpayer. But from here to attacking Ben-Gurion University and to employ thuggery that may jeopardize the very existence of the university and its students, the distance is great. Very great. The donations received by the universities are used for research and development. Many students from southern Israel study at the university for whom it is the only possibility to pursue studies in a top ranking institution and still remain in their parents’ home. The donations also help create scholarships for poor students. Anyone with clear vision can see that such a process [attacking the university] spells throwing out the baby together with the bath water, and causing damage to a great many people. These students are the ones who hear the very lecturers against whom Im Tirtzu’s campaign ranted. Some of them are no less Zionist than the members of Im Tirtzu. Most of them served in the army, continue to serve in the reserves and care about Israel. They understand no less than many of us the essence of Zionism, as they live in the Negev on a daily basis. Does anyone believe that these students lack the ability to tell right from wrong? Does anyone believe that some delusional lecturer like Niv Gordon will cause this or that student to stop doing reserve duty? Are Im Tirtzu the only Zionists left out there? The answer is no. Unequivocally no. Evidence is mounting that the Institute for Zionist Strategies (IZS) — an Israeli NGO at the forefront of an ongoing campaign to purge Israeli Universities of faculty and programs deemed “left-wing” — is a creature of The Hudson Institute, a major Washington based neoconservative think-tank, which played an active role in shaping the Bush administration’s Middle East policies. 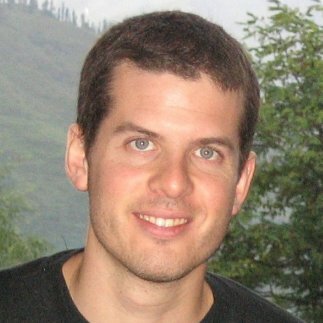 Hudson is the primary financial backer of the IZS, providing at least half of the organization’s total reported multi-year funding, but the connection does not end there. 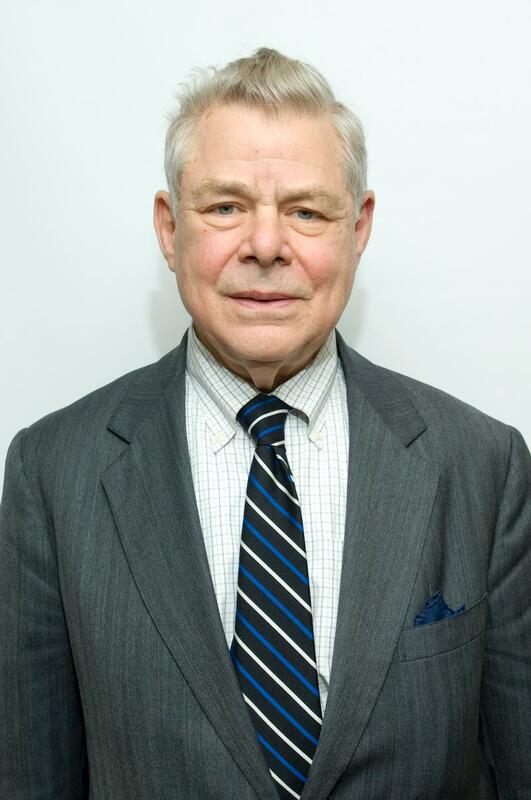 Max Singer, co-founder of the Hudson Institute, its former President and current Senior Fellow, is also the IZS’s Research Director. At least according to his bio on the Hudson website: The IZS site only identifies him as a member of the Advisory Committee. Its 2006 brochure (page 8), however, states that he is a member of the International Board of Governors and is one of the ex-officio members of the Projects Committee, which “as such, are invited to all deliberative sessions and events.” According to the IZS’s verbal report to the Israeli Registrar of Associations for 2008 (the last one filed), Singer’s wife, Suzanne, is one of three members of the NGO’s “Council”, the sovereign decision-making body under Israeli law. The IZS will help liberate the public discourse in Israeli society from the self-imposed constraints of the prevalent dogma and internalized notions of the politically correct. Israeli society needs to be freed from the acceptance of double standards so that we can become comfortable asserting our own national purpose as a sovereign Jewish community. The Future of Zionism. The Center for Middle East Policy is launching a multi-year project to examine the future of Zionism and its implications for the State of Israel. Israel faces an ideological crisis: As the recent Gaza pullout showed, societal divisions between secular and religious Israelis and between left and right wing camps have become so pronounced that they threaten to overpower the Zionist consensus that traditionally unified the nation. [Hudson Institute Form 990 Report to the IRS for 2005, page 23]. For a generation, Singer has been involved in designing and promoting aggressive US foreign policy. In the early 1980’s he was on the board of Friends of the Democratic Center in Central America (PRODEMCA), a controversial organization involved in the Iran-Contras scandal. In 2002, he published The Many Compelling Reasons for War with Iraq. To prevent Obama from bringing America behind his different view of the world, Israel needs to help Americans appreciate the way that Obama sees things differently than they do. The views of most Americans, and of most of the American political world, are much closer to Israel’s understanding of Middle Eastern realities than to Obama’s perceptions. Israeli actions can help Americans to recognize the conflicts between what they believe and the premises of Obama’s proposed policies. The critical element in Israel’s policy concerning the US is the degree to which Israel is able to recognize, stimulate, and get the benefit of the parts of the American policy-making system that do not share President Obama’s radically different ideas about the world. Israel does not have to act as if Obama’s views will necessarily determine the policy of the US, and it certainly does not have to assume that Obama’s current views will dominate US policy-making for many years. Israel has the power, if it has the fortitude, to influence the degree to which Obama is able to make the tectonic change in American policy that he would like to make. Emanuel was angry, he claimed, because Dermer briefed certain Americans, Jewish and non-Jewish, against the President and Emanuel himself. Last Thursday (August 19 2010) Coteret demonstrated that The Hudson Institute, a major Washington based neoconservative think-tank, which played an active role in shaping the Bush administration’s Middle East policies, has been the largest financial backer of the Institute for Zionist Strategies (IZS) — an Israeli NGO at the forefront of an ongoing campaign to purge Israeli Universities of faculty and programs deemed “left-wing.” Hudson provided at least half of the NGO’s total reported multi-year funding, dwarfing all other sources of income. The post also mentioned that, in the 2006 tax year, Hudson provided $600,000 to the Atlantic Forum of Israel (AFI), an opaque, security-oriented, organization founded by the Israeli National Security Adviser, Uzi Arad, and run by him until last year. Beyond raising the total value of the relationship between the Hudson Institute and Arad’s outfit to at least $710,000, this information also reveals a multi-faceted relationship: AFI was both a grantee and a contractor for the institute. The question of whether Israel should attack Iran and whether the US should support such a move is very tangibly on the (publicly perceived, at least) policy agenda of both governments. Uzi Arad has publicly articulated his (hawkish) position on the issue. The Hudson Institute recently provided an opaque, security-oriented, NGO founded by Uzi Arad and, until last year, run by him, with over half a million dollars of funding. The Hudson Institute is a central component of an active and ideological neoconservative opposition to the foreign and security policy of the current US President; Uzi Arad serves as National Security Adviser to the current Israeli Prime Minister. Shira Beery provided significant research for this post. Newly uncovered documentation reveals that The Hudson Institute, an influential and activist neoconservative think-tank, has provided nearly $500,000 to the Institute for Zionist Strategies (IZS), an Israeli NGO at the forefront of an ongoing campaign to purge Israeli Universities of faculty and programs deemed “left-wing.” The grants represent more than half of the IZS’s total reported multi-year funding and position Hudson as the organization’s largest donor. In addition, the documents indicate that Hudson provided $600,000 to The Atlantic Forum of Israel, an opaque, security-oriented, organization founded by the Israeli National Security Adviser, Uzi Arad, and run by him until last year. Im Tirtzu chairman Ronen Shoval and the organization’s spokesperson, Erez Tadmor, took part in a Young Leadership program run by the Institute for Zionist Strategies several years ago, seemingly contradicting the two men’s earlier assertion that they were not acting in concert with the institute in their public campaign against the “anti-Zionist bias” in Israeli universities. The IZS report on sociology departments is reminiscent of Im Tirtzu’s report on political science departments. Not only is the methodology of the two reports identical (an examination of syllabi and a classification of lecturers into categories such as “Zionist” and “anti-Zionist” ), but the conclusions they reached about the state of Israeli academia are similar. 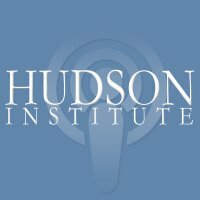 Previously unpublished documents, analyzed in this post, demonstrate that The Hudson Institute, a major Washington based neoconservative think-tank, which played an active role in shaping the Bush administration’s Middle East policies, has been the largest financial backer of the IZS, providing at least half of the NGO’s total multi-year funding and dwarfing all other sources. According to the IZS’s own reports to the Israeli Registrar of Associations, the Hudson Institute provided 100% of the organization’s external funding in 2006 — $105,881 — and 2007 — $325,462. External funding for 2008 (the last year reported) was $50,351, coming exclusively from a rather bizarre source: The Palestine Exploration Fund (PEF). The IZS was established at the end of 2004 (registration document here). Its 2006 financial report states that donations worth $431,597 were received in 2005. The Hudson Institute’s form 990 for 2005 does not provide details of external grants. Therefore, confirming that it was also behind these funds requires the IZS’s 2005 report, which Coteret has not yet obtained. Even if this year is discounted, however, Hudson has provided over 53% of IZS’s total reported funding and is its largest donor. The Hudson Institute’s involvement in controversial and partisan battles in the Israeli public sphere is legitimate. What is not is the fact that it is hidden from the public eye. The organizations share information on their financial relationship with their respective regulators but not with the general public. Both the IZS and the Hudson websites do not mention the organizations’ connection. In Hebrew, the IZS site simply states that its funding is “private.” In English, it refers potential donors to a newly established (it has registered but not yet filed with the IRS) US charity, “Friends of the Institute for Zionist Strategies.” Indeed, identifying and documenting this connection required many days of work spread over the better part of a year. In recent months Israelis have witnessed an unprecedented barrage of anti-democratic campaigns, from Im Tirzu to the Land of Israel Forum. All of these campaigns are funded by unknown sources. It is the funding of those wishing to silence Israel’s human rights groups that is hidden from the public. It appears that the Hudson Institute’s opaque involvement in Israeli affairs is not limited to “democracy” issues and encompasses high-level geopolitics as well. Its form 990 for 2007 (last page) reports on the transfer of $600,000 to the “Atlantic Forum of Israel” in the previous tax year. Trying to understand what this organization does is no easy task. Its website is “under construction”. The website of the (now defunct) American Jewish Congress explains that it is “Israel’s official non-governmental representative” to NATO. 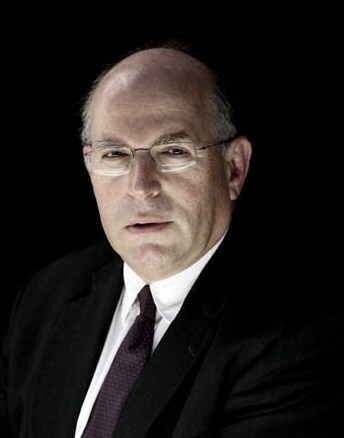 An October 2009 article in Haaretz reports that Uzi Arad resigned as President of the Forum before assuming the position of Netanyahu’s National Security Adviser. The Saban Forum 2007 itinerary (page 9) adds that Arad founded the NGO. The facts listed above may be unrelated. That cannot be confirmed, however, without full disclosure. All involved (and given what’s at stake, that includes you and me) have an interest in moving that process forward. NIS 471,858 at an average yearly exchange rate of 4.4565. Click here to view original report, data on page numbered 8. NIS 1,337,031 at an average yearly exchange rate of 4.1081. Click here to view original report, data on pages numbered 3 and 7. NIS 180,650 at an average yearly exchange rate of 3.5878. Click here to view original report, data on pages numbered 3 and 7. A UK charity “founded in 1865 and is the oldest organization in the world created specifically for the study of the Levant.” Its grants, however, are made to individual researchers, and the 2008 grant list does not mention the IZS or anyone associated with it. NIS 1,936,922 at average yearly exchange rate of 4.4878. Click here to view original report, data on page numbered 3. Israeli NSA Arad on-record: Two states? That’s a zero-sum game! Arad also leveled veiled criticism at the two-state solution. “On the one hand, most of the people of Israel see the two-state solution as the path to a peace agreement. There are even quite a few Israelis who have mobilized for a Palestinian state and the promotion of its legitimacy, and are winning converts to it. Anyone who read Arad’s ‘Dr. Strangelove’ interview last year, cannot really be surprised by anything he says. This is an important reminder, however, of who has the Prime Minister’s ear on Israeli-Palestinian issues. I think journalists who repeat ad nauseum that Palestinian rejectionism is the only obstacle to peace breaking out would find it useful. Also, Gidi Ginshtein at the Reut Institute might want to add the speech as a reference in his latest report, which contends that the mortal danger currently facing Israel is from forces trying to undermine the legitimacy of the two state solution. Yesterday, National Security Adviser Dr. Uzi Arad fired arrows of criticism in every direction and made unusual statements on a series of current affairs. He sent barbs in the direction of Defense Minister Ehud Barak, who, according to reports, is not allowing the National Security Council to do its job, aimed criticism at Opposition Chairwoman Tzipi Livni, who believes that a peace plan will extricate Israel from the diplomatic impasse, said that Israel’s enthusiasm over the two-state solution is damaging to Israel’s legitimacy, and gave legal justification for a military attack on Iran. In a speech to the members of the Jewish Agency Assembly in Jerusalem, Arad said of the peace initiative being pushed by high-ranking Kadima officials, “Some say that we need to offer a peace initiative, and I must assume that the leader of the opposition, Ms. Tzipi Livni, will agree to that. There is no need to think that this is the magic and promised solution. The headline is, of course, sarcastic. Gerald Steinberg’s interest in “Lawfare” is instrumental and limited to his campaign to suppress the Israeli human rights community. Otherwise, why would reports on right-wing Israeli organizations whose activism is focused on legal activism be so conspicuously absent from his organization’s website? Try finding even an acknowledgement of the “Lawfare” activities of Shurat Hadin — Israel Law Center, The Legal Forum for the Land of Israel, The National Land Protection Trust or Human Rights in Yesha and you’ll come up empty handed. Steinberg’s base hypocrisy — he’s even launched his own major “Lawfare” action in a European court — would be comic if it wasn’t so dangerous. Influential publications such as The New York Jewish Week regularly turn to him as a commentator on Israeli policy. More importantly, draconian legislation he designed to severely limit the freedom of action of any NGO that does not toe government policy is set to be enacted by the Knesset. 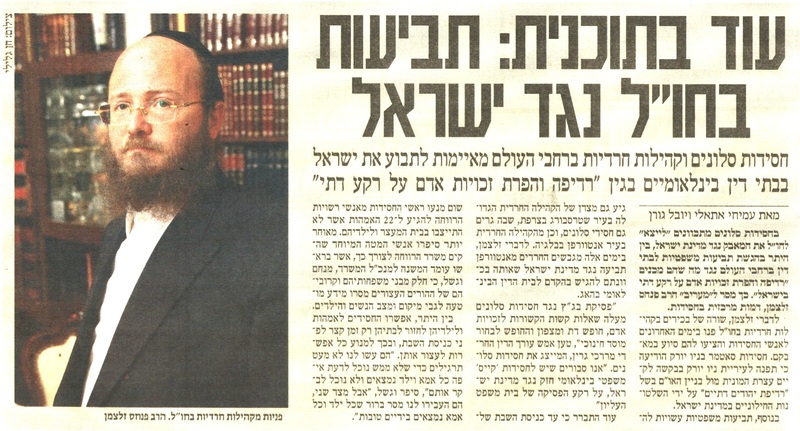 The Slonim Hasids intend to “export” their struggle against the State of Israel abroad by bringing lawsuits in courts throughout the world against what they term “persecution and the violation of human rights on religious grounds in Israel,” Rabbi Pinhas Salzman, a major figure in the community, has told Ma’ariv. According to Salzman, several high-ranking figures in the Haredi community abroad recently contacted the members of the community with offers to aid their struggle. The Satmar Hasidim in New York announced that it would ask the New York municipality for permission to hold a rally in front of the United Nations to protest “the persecution of religious Jews” by the secular authorities in the State of Israel. In addition, the large Haredi community in Strasbourg, France, where Slonim Hasidim also live, is expected to bring a lawsuit, as is the Haredi community of Antwerp, Belgium. According to Salzman, the Haredim of Antwerp are now drafting a lawsuit against the State of Israel which they intend to bring in the international court in The Hague. It also turned out that until the beginning of the Sabbath two days ago, the leaders of the Hasidic community prevented officials of the Welfare Authority from going to the 22 mothers who did not show up at the prison and their children. Later on, the members of the special task force that the Welfare Authority established for this purpose, which is directed by the ministry’s deputy director general, Menahem Wagschal, recounted that some of the family members and relatives of the imprisoned parents gave misleading information regarding the whereabouts and the situation of the women and children.